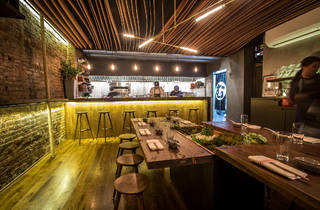 Mu Ramen, the noodle insta-hit from husband-and-wife team Joshua and Heidy Smookler, is a warmly lit, brick-walled room with a scant 22 seats. 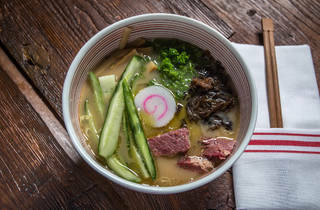 But it’s an upgrade from the couple’s pop-up days, when they doled steaming bowls out of a nearby bagel shop. 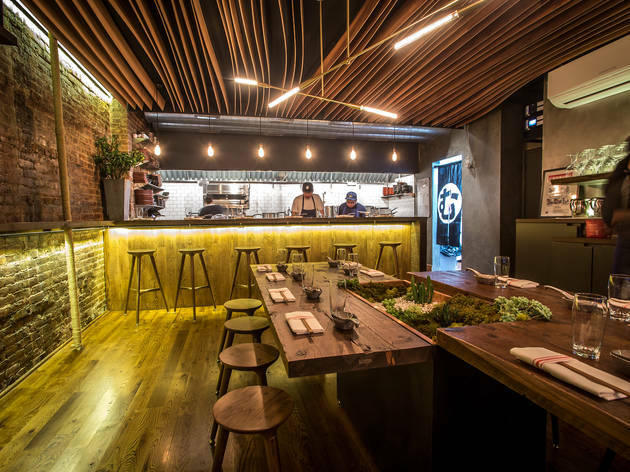 The best seats in the house are at the bar overlooking the open kitchen, where the chefs operate with sushi-bar intimacy, cracking jokes while pulling golden-crisp chicken from the fryer and shaking pots of just-boiled noodles as easily as tumbler-happy bartenders. Those strands are delicate but with an al dente spring, and there's a different variety showcased in each bowl. 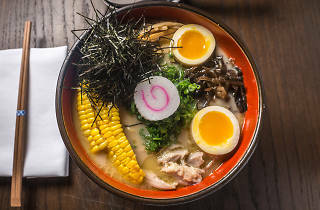 Most notable, though, is the flagship ramen. 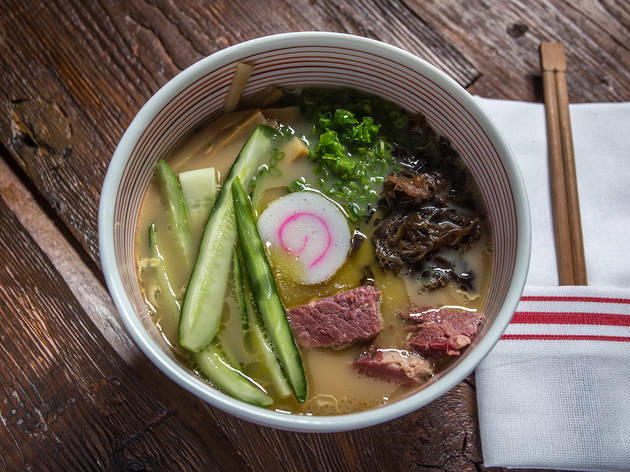 Built on a broth of oxtail and bone marrow, the house bowl gets some extra-meaty oomph from melting cubes of brisket, which, paired with shredded cabbage and half-sour pickles, toes Jewish deli-novelty without succumbing to kitsch. 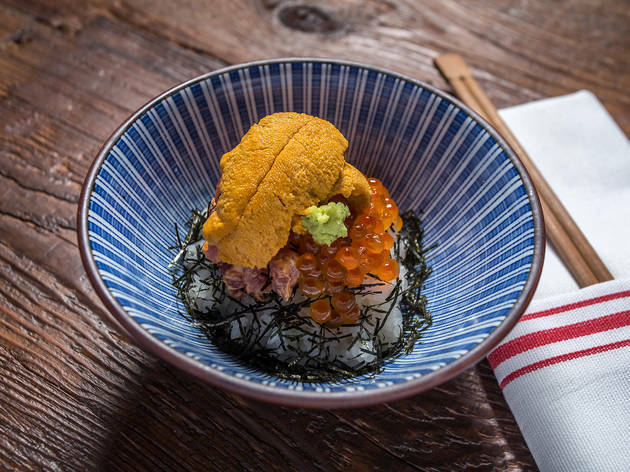 The chefs’ careful hands extend to non-noodle plates like the U&I. 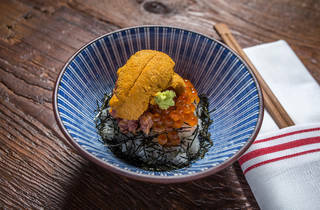 “Get everything in one go,” a sous chef instructs, and he’s right: A chopstick of warm rice spackled with butter-soft uni, briny, bursting salmon roe and luscious spicy maguro is a supremely composed bite. Then there’s the tebasaki gyoza, a deboned chicken wing crammed dumpling-style with creamy foie gras, soft brioche and quince compote. It’s a salty-sweet, creamy-crispy food anomaly that alone is worth the trip. 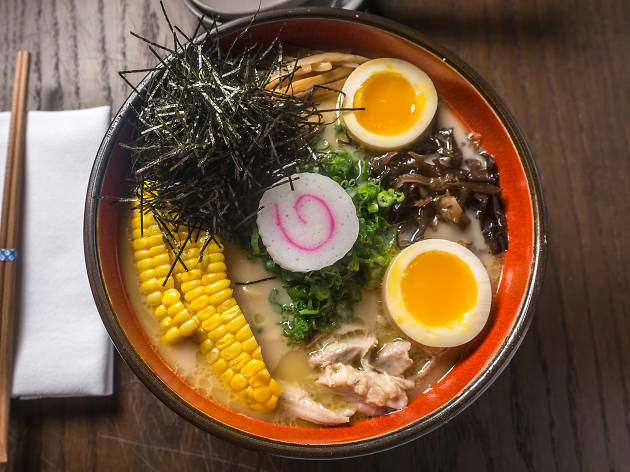 Average ramen: $18. Cash only. Mu Ramen is my favorite! Jowl is very good add on with ramen!! Also their service is very good.